I recently had the opportunity to spend a day with Brett, as he whisked around the Vegas Strip. The day started with a seemingly full itinerary of visits, to which Brett tried to squeeze in, “Just One More Restaurant”, throughout the day. Part of the impetus for over-stuffing the itinerary was that Manuata Martin, Brett’s Tahitian Vanilla supplier, was in town and joining us on the restaurant rounds. The whole itinerary has to fit into a relatively short time frame, since Chefs work late into the evening, not many arrive at their kitchens before noon and by late afternoon they’re too busy preparing for diners to meet with Brett. One of our first visits was with Chef Gary FX LaMorte the Chef de Cuisine at Andre’s at the Monte Carlo, and since Gary lives on Vegas Chef Time, an afternoon visit coincides with his morning coffee time. Gary used Manuata’s Tahitian Vanilla to prepared hands down the best latte I’ve ever tasted. 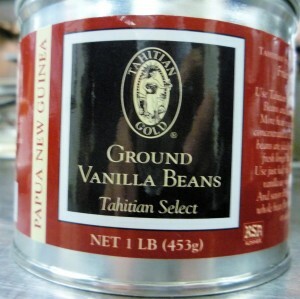 The Vanilla, besides adding great flavor to the latte, also serves to amplify the sweetness of the sugar. I don’t usually wax poetic about beverages, but this is one of those times you could pull out all the cliches and still fall short of the mark. If you dine at Andres be sure to ask for a Vanilla Latte, make that a Tahitian Vanilla Latte. Brett views these visits more as educational opportunities for the Chefs rather than mere sales calls. The Chefs are so busy, they really don’t have time for sales pitches, they need to learn something about the ingredient to make it worth their time. 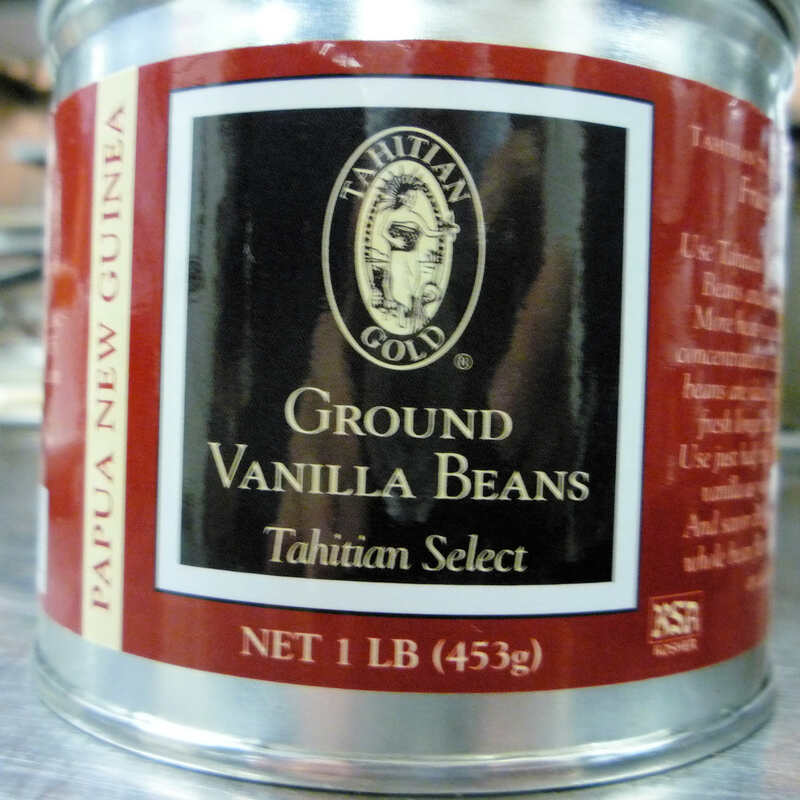 Manuata describes to Gary the two species of Vanilla Beans that he sells, Planifolia and the highly sought Tahitensis, which as the name suggests is native to Tahiti and has a more floral and fruity flavor profile. Manuata sells the familiar alcohol based Vanilla extracts, but the form that garnered the most attention was his Vanilla Bean Paste. Manuata has developed a 12-day proprietary method to capture and retain fresh whole bean flavor, which are not only has a more concentrated flavor than non-prepared Vanilla beans, the paste can be stored for a longer period of time without a reduction in quality. 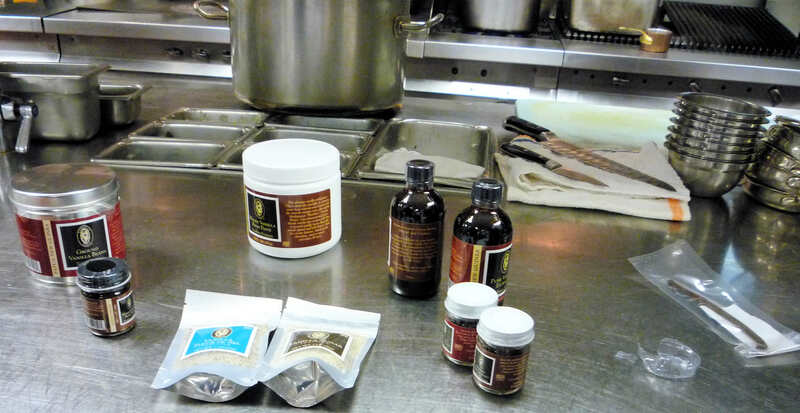 The Chefs that we met with were all at the pinnacle of the Vegas restaurant scene, and were accustomed to starting with the most basic ingredients, and doing all preparations in-house, such as grinding Vanilla Beans on-site to create their own Vanilla paste. So, while Manuata sells his own Tahitian Vanilla Sugar and Vanilla Fleur de Sel, which combines the highly prized sea salt from Guerande France with Tahitian Vanilla, the Paste was the focus for all the Chefs we met. One surprising use of the Vanilla, which both Gary at Andre’s and Chef Drew Terp at Shaboo and Bar Masa discussed was in high-end cocktails. Andre’s makes a Foie Gras Martini that has become famous among internet foodies. Now you have two beverages to sample at your next meal at Andre’s, The Foie Gras Martini and the Vanilla Latte. 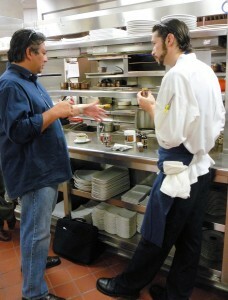 Manuata describes his Vanilla Bean Paste as Gary examines a sample. Brett Ottolenghi and Bill Clinton may seem like an unusual juxtaposition, but in Las Vegas the unusual is usual. Brett met Bill Clinton in a very Vegas way. Bill Clinton was in town to help Harry Reid, the Nevada Senator that was in a very tight reelection campaign. Brett has a friend that is a VIP host at Tao Nightclub, a high-end Nightclub at the Venetian. VIP Hosts in Vegas seem to have access everywhere and when you’re hosting a team of Professional athletes, nothing is out of bounds, even the former President of the United States. As Brett was retelling his meeting President Bill Clinton, he said how he regretted not mentioning to the President his concern that children are not taught about food and proper nutrition in school. 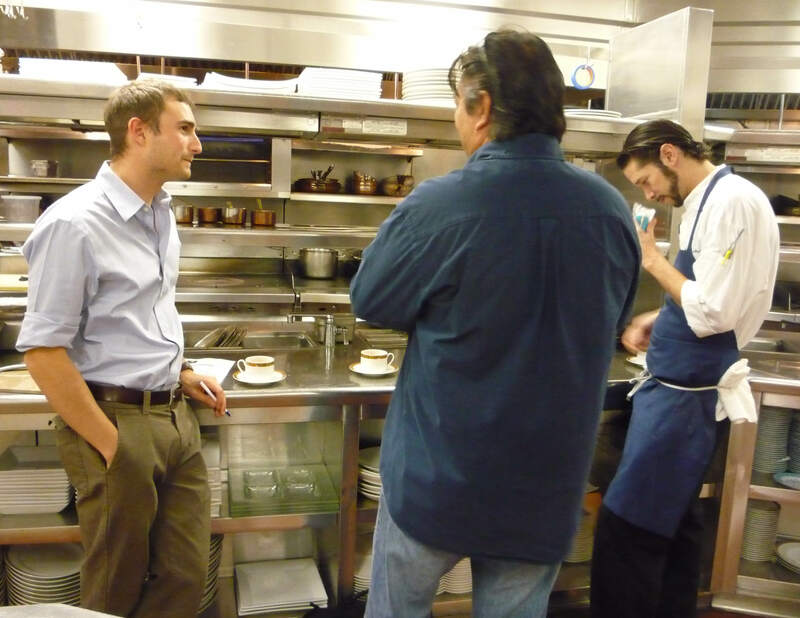 Obviously, Brett takes his role as Food Educator seriously, whether you’re a top Vegas Chef, The President of the United States, or a person that writes essays about Las Vegas, Brett wants you to be more interested and informed about the food you consume. Brett enters a Vegas Kitchen the way a masterful politician enters a room, perhaps even Clintonian’esque, he greets everyone, as if he were asking for their vote. He’s careful to include the Chef’s key assistants on his product discussions, todays Sous-Chef could be tomorrows Celebrity Chef. That is not to say that Brett comes off as Slick or Disingenuous, Earnest would be more accurate. I think Brett feels this passage belittles the true relationship even friendship he has with many of the Chefs in Las Vegas. The other aspect of the article that Brett was less than pleased with was the whole discussion of the clothes he wears when making restaurant calls: The unfashionable brown suits and brown shoes with fake eyeglasses, of which he is quoted in the article as having twenty pairs. As a side note: The New Yorker which is notorious for their fastidious fact checking, actually fact checked this with Brett, and wrongly quoted him, he’s never had twenty pair of fake glasses. The whole point of his outfit, was to appear a few years older, and perhaps more mature, a rarity these days. Brett is only twenty five years old, and is often dealing with customers decades older. The readership of the New Yorker may be small in Las Vegas, but some important people there have taken note. The executives at CityCenter have sent a copy of the article to every restaurant in the complex, inviting them to source products through Brett. Reality Television producers have also taken note, over thirty production companies have contacted Brett about doing a Reality Television Show. Brett has chosen to work with the producers of the Travel Channel show “Man versus Food” It sounds like the show may be similar to Gordon Elliot’s show “Follow That Food” on the Food Network. Brett is insistent that he doesn’t want a hyped-up phony reality show. While the title of the New Yorker article is “The Truffle Kid”, Brett has shifted his focus away from truffles, its a difficult item to sell profitably without undue risk. When he takes a basket of truffles around the Strip, he finds that the chefs want to hand select each individual truffle they buy, hence by the end of his rounds he is left with the least desirable ones, which may not be salable at a profitable price. Brett is always looking for new Artisanal Food products to add to his inventory. He told me about a small farm in Pennsylvania that raises free-range chickens akin to the way the Japanese raise their Kobe Beef Cattle. He is known in Vegas as the go to person for exotic hard to find unique food items. When Phil Ruffin’s wife wanted special honey to serve with tea in her high-end spa at TI she reached out to Brett. Bellagio restaurants and bars often contact Brett with special requests, such as recently a high-end Bellagio bar, aren’t they all high-end at Bellagio, asked him to source gourmet large green pitted olives with which they could hand stuff with blue cheese. While most of the items Brett sells are pricey compared to their lower grade alternatives, the profit margins are small in relation to the effort involved. Bellagio compensates Brett for all his hard work in sourcing small order specialty items by giving him the contract to supply Duck Breasts to their buffet. Even on the Duck Breasts, Brett is able to offer the Bellagio Buffet a good price, since as he notes, these are Foie Gras Ducks, and hence to the supplier “the real money” has already been made on the foie gras, the Duck Breasts are just extra cash. If you’ve eaten at one of the Michelin Star restaurants in Vegas, or the Bellagio Buffet you have a had a chance to sample some of Brett’s products. However, if you wish to purchase items directly from Brett you have tow options. Two: You can visit his store, which is located adjacent to McCarran Airport at 2275 E. Sunset Rd. Brett thanks again for letting me tag along on your visits on Wednesday, it was interesting, educational, enjoyable, and exhausting!